Brrrrr... it's really started to get cold, hasn't it? After our long, hot summer and mild March and April, I'm really feeling the cold! (I realise this our weather is nothing compared to the most recent European winter, but what can I say? I'm a wimp!) It's totally the weather for warm and comforting stews and bakes. Preferably with cheese. 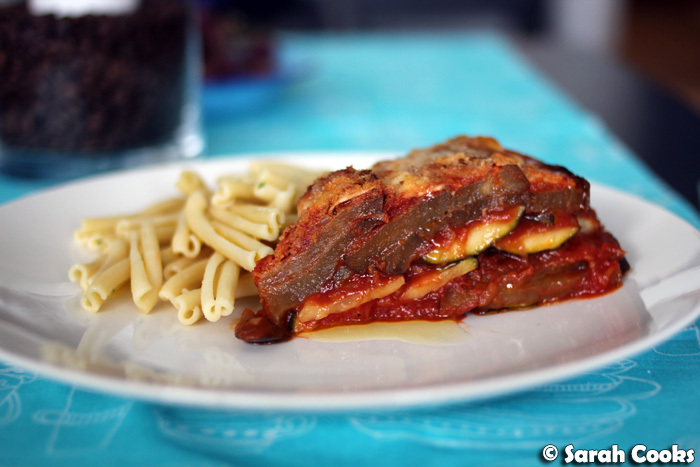 This eggplant and zucchini parmigiana is something I made to use up the eggplant and zucchinis we'd gotten delivered in the organic veggie box. 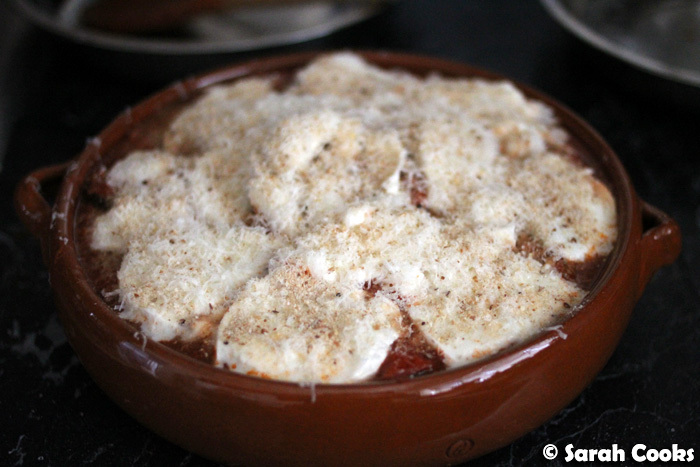 It's just grilled eggplant and zucchini, layered with a tomato sauce and topped with buffalo mozzarella and breadcrumbs. 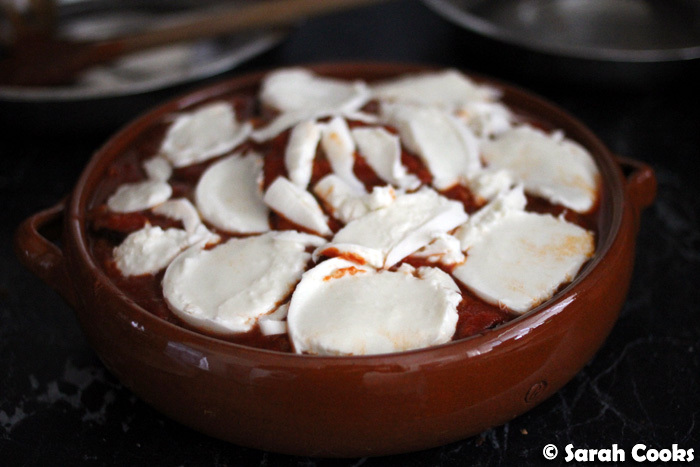 You don't necessarily need to use expensive buffalo mozzarella, but I do love it so very much, and my local supermarket often sells DOC buffalo mozzarella at reduced prices when they get close to the use by date. Score! It's warm and comforting, but not in the least bit stodgy. There's no meat, and it's easily adaptable to become gluten free and/or low carb (just omit the breadcrumbs and choose an appropriate side). 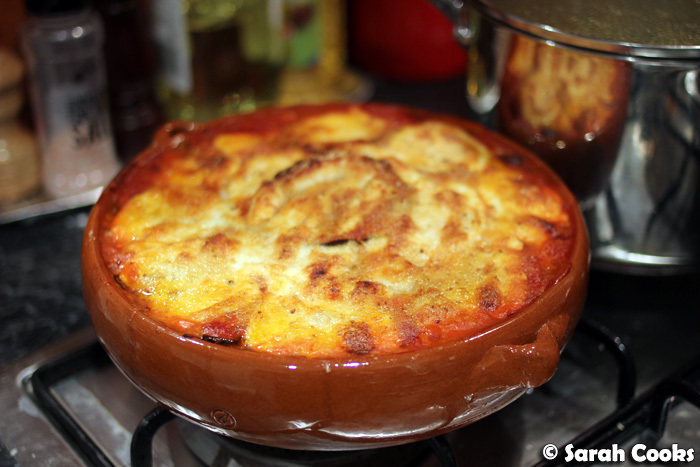 I just made it up as I went along (see recipe below), but the idea itself is a classic one, and there are versions of it all over. 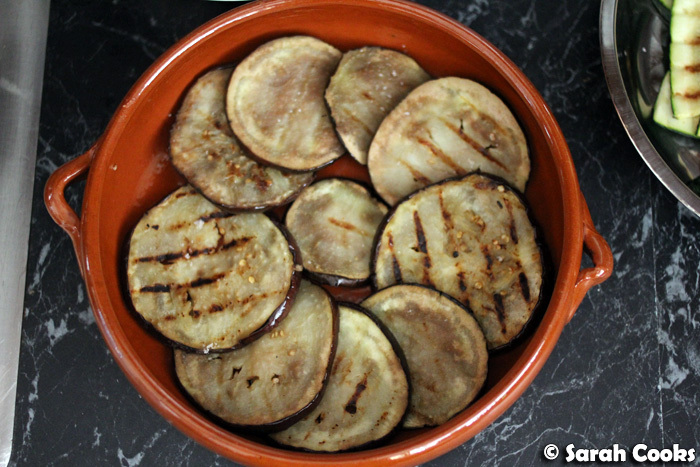 The dish isn't difficult, but it is time consuming, as you've got to grill the eggplants and zucchini, make a tomato sauce and bake it all. But I think it's something nice to do on a cold and windy day. 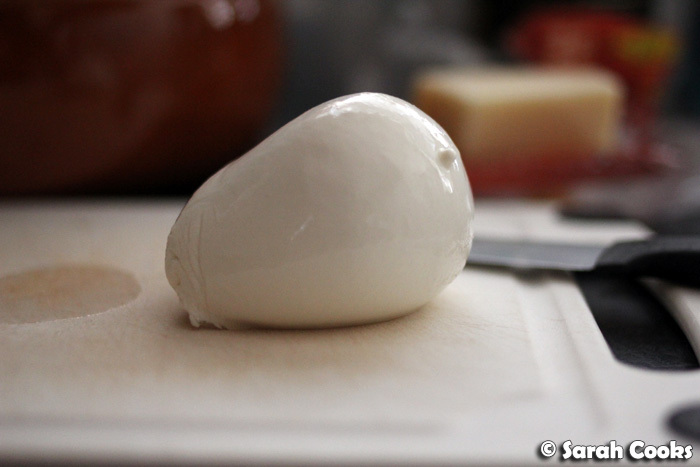 And here's the beautiful ball of buffalo mozzarella. Love it! I find it tricky to slice the mozzarella neatly, but once it's blanketed with breadcrumbs and grated parmesan cheese, and baked, you can't tell. I served it with hot buttered noodles (with a few chives snipped through for extra deliciousness), but I think crusty bread, mashed potato or rice would be equally good. Heat a griddle pan to medium-high heat. Slice the eggplant crosswise into slices just under a centimetre thick, and slice the zucchini lengthwise into slices of the same thickness. Brush the slices with olive oil and grill for a few minutes on each side until cooked through and soft. Set aside. Heat some olive oil in a saucepan. Finely chop the onion and celery, and finely grate the carrot (or just whizz it up in a food processor). Add to the saucepan with a generous pinch of salt and cook for five to ten minutes, or until softened. Add the minced garlic and cook for a further minute. Add the tomato passata and stir well. Bring to the boil, then turn the heat to low and simmer for twenty minutes. Brush a 20cm round ceramic dish with olive oil. 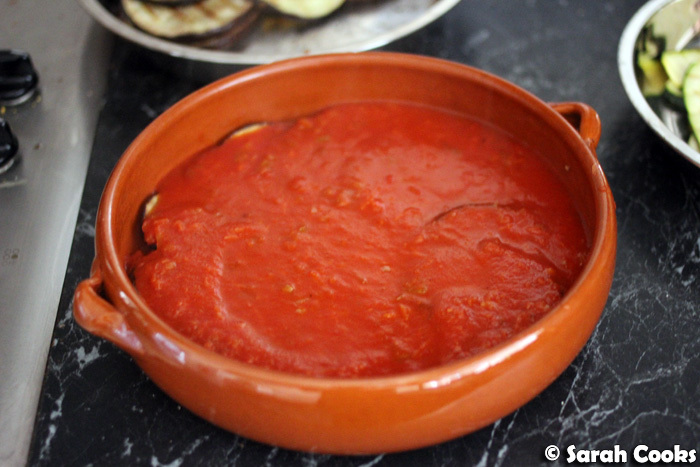 Arrange a layer of eggplant slices on the bottom, followed by a third of the tomato sauce. 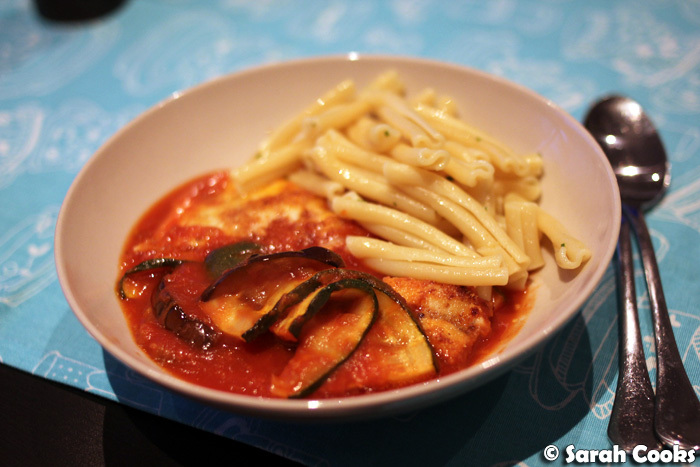 Then arrange the zucchini slices on top, followed by another third of the tomato sauce. Finish with the remaining eggplant and tomato sauce. Rip or slice up the buffalo mozzarella and arrange on top. Grate some parmesan cheese over and sprinkle with breadcrumbs. Bake for 20-30 minutes, or until piping hot all the way through and golden brown on top. Serve with crusty bread, hot buttered (and chive'd) pasta or any carb of your choice. 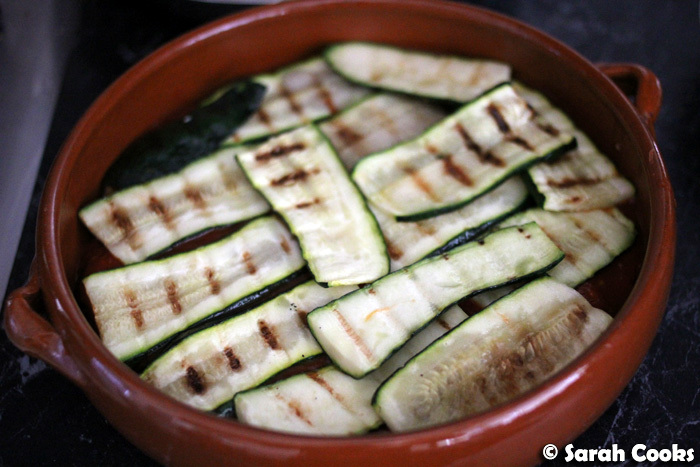 oooh grilled zucchini & eggplant & melted cheese = winner combi! This is going onto my 'Meatless Mondays' meals! Hey hey! It's a Graupera pot, which I got at The Essential Ingredient in Prahran! What about Canadian winter?! I HAD SIX MONTHS OF WINTER. Snow literally at the end of October and the end of April. I almost went The Shining on everything. But I'm trying not to yell at you Australians moping about your above-freezing temperatures. After all, it's relative, and cheese is good. It is absolutely freezing I agree! Once the sun goes down it's arctic (okay I'm being melodramatic but you know what I mean hopefully. So much work, but looks so good! So definitely rewarding! I'll be making this tonight with the last of our garden zucchini.